The new Messaging app works by integrating Skype, allowing you to chat to Skype contacts or initiate video / audio calls. All the conversations are synced between PCs, tablets, and phones, and the new app looks like a lightweight version of Skype. It's also identical to the Messages app on OS X, with the same two-panel interface and circular UI for contact photos. Microsoft has started linking Skype usernames with mobile numbers to make it easier to find friends who are using the service without having to know their user ID. That makes this whole approach a lot more like iMessage, allowing Skype users to chat to friends easily on the service. The main difference is that Skype is cross-platform so you can chat to friends on iOS, Android, BlackBerry, Windows, and more, while iMessage is limited to Apple's platforms. 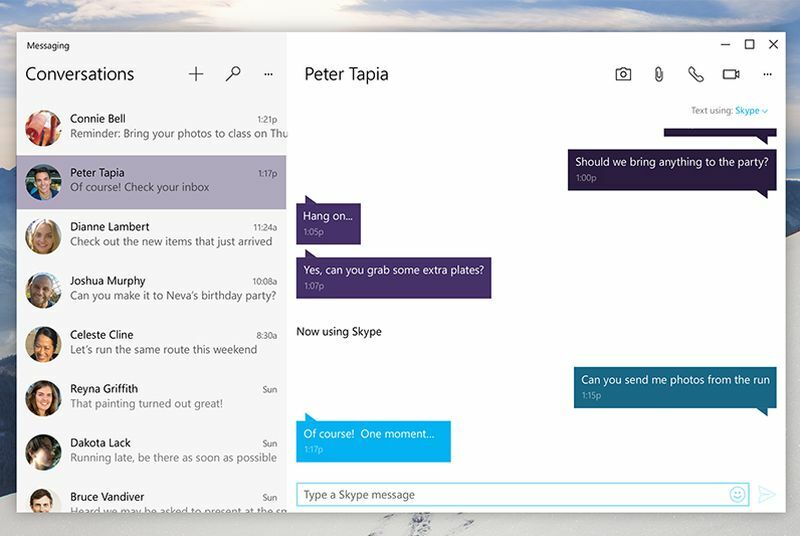 The built-in Skype experience on the phone version of Windows 10 also allows you to send text messages, but it's entirely possible (and likely) that Microsoft will extend this functionality and sync state to the PC version just like iMessage. In Microsoft's new world Windows 10 apps are the same across PCs, phones, and tablets, so such a move would be expected. Microsoft isn't fully detailing its Messaging app plans just yet, but it's encouraging to see the company move to a more native and simple integration of Skype instead of separate and unnecessary apps. All that's needed now is the complexity of usernames to fully disappear so everyone can use Skype just with their mobile number.